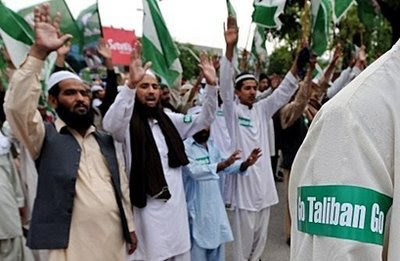 Pakistan: Town Falls to Taliban Thousands Flee……. – The Tundra Tabloids……. Pakistan: Town Falls to Taliban Thousands Flee……. Taliban: All we are saying, is give us those nukes! The Tundra Tabloids now assumes that Obama’s search for the “moderate Taliban” has officially ended before it even began. The Counterjihad knew that it would end in failure, for their is no such thing as “moderate” in Islam, there’s just Islam. Let’s see how O-bow-ma gets the Pakistanis and the Afghanis to wage war on their co-religionists while winning over the “hearts and minds” of those caught in the middle. The recent killing of Afghan civilians in last weeks raid might set things back a bit don’t you think? KGSNOTE: When it’s Israel doing the bombing against Islamofascists and civilian are killed, all the Lefties and their Islamic pals seethe with rage, but when it’s the B.Hussein Obama administration doing the bombing and civilians dying… there’s just respectfull photo ops and press conferences. ISLAMABAD, Pakistan — Armed Taliban insurgents seized control of the main town in Pakistan’s Swat valley, sending thousands of residents fleeing in advance of a possible showdown between the Islamic militants and the army that could help decide the future of nuclear-armed Pakistan. “Pray for Swat,” implored Yusufzai, driving south with his wife and three children toward safety and an uncertain future. The Taliban have dominated Swat since February, when the government agreed to establish Islamic courts in exchange for a cease-fire, and last month they sent forces into neighboring Buner, where the government capitulated without a fight. “The army is going back in as we speak,” Holbrooke quoted him as saying on the eve of Zardari’s meeting Wednesday with President Barack Obama in Washington. Despite Zardari’s assurance, however, there was no sign Tuesday that a major army operation had begun in Swat, and residents reported that Taliban had mined the roads into Mingora to block any army offensive. Pakistan’s army has proved to be ill equipped and ill trained, particularly to fight an Islamist insurgency with which many military officers sympathize, but the militants’ advance into Swat and Buner poses an unparalleled threat to Zardari’s government and to the U.S. battle against al-Qaida and the Taliban. Previous Post Previous Post Finnish-Funded Afghan Prison Turns Brothel……. Next Post Next Post MEMRI: Egyptian Singer Swoons About Swine…….